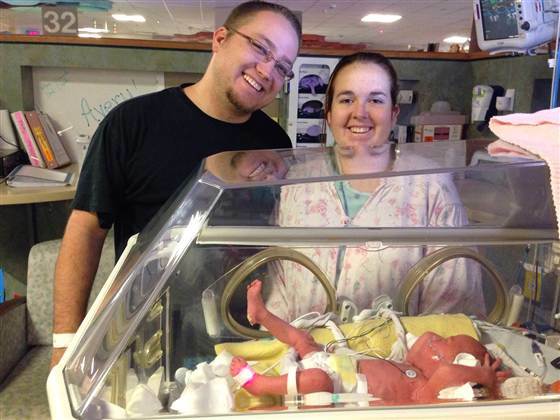 Home » Dad Fathers Identical Triplets After Vasectomy Reversal! Chad Doss was the proud father of two young children, and he loved being a dad. But sometime after those two children had been born, he’d decided his baby-making days were over. Then he met Amanda, his current wife. Although Amanda loved his children from his former marriage as if they were her own, Chad knew she wanted to experience the journey of motherhood from pregnancy and beyond. But their family would expand more than “just a little bit.” Instead, it would more than double in size when the couple learned they were expecting triplets!!! At first, they were shocked to learn they’d be having three babies instead of one, but that quickly changed to excitement as the couple prepared for the impending birth of their rare identical triplet girls. Amada’s doctor, Dr. James Sumners, a maternal-fetal medicine specialist, likened learning you’re having triplets is “like being hit on the head with a baseball bat.” But he said the couple is well prepared for the challenges that they are about to face. 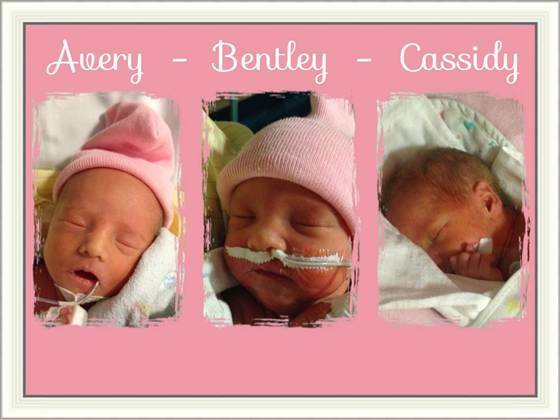 Born at 31 weeks on December 30th without complication, the three girls were named after their placement in the womb (babies A, B, and C). 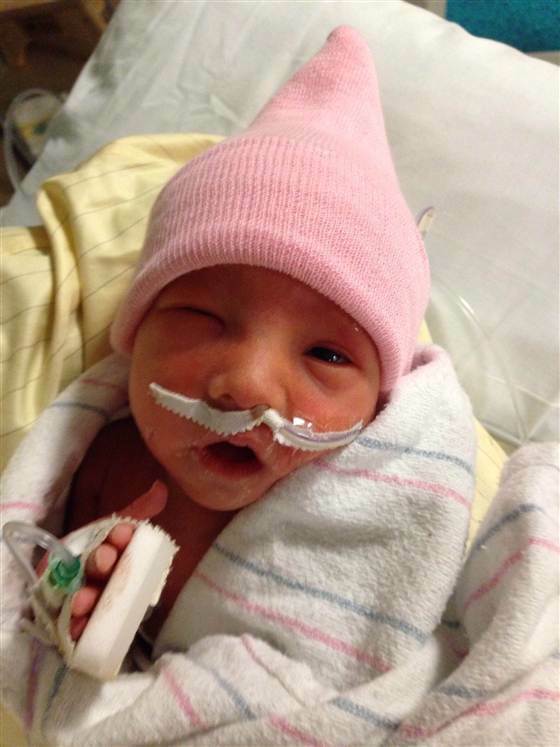 Avery, who was born first, came in at 3lbs, 15oz. Cassidy was born next at 3lbs, 11oz. Bentley came last, but was the heaviest at 4lbs, 3oz. Though they are doing very well, the girls will have to spend a bit more time in the St. Vincent Women’s Hospital neonatal intensive care. A few more weeks is what the hospital is estimating, but the family is hoping for sooner since the girls are doing so well. They’re even breathing on their own already! They may not be too far off with their miracle claim…while successful vasectomy reversals are fairly common, particularly in the first five years (odds of about 66 percent, according to Chad’s urologist, Dr. Samuel Thomspon). On the other hand, naturally conceived identical triplets are so rare that there aren’t any ‘official’ studies to give exact figures, are thought to be odds of about one in a million. Of course, no matter what the odds, Avery, Cassidy and Bentley are miracles to their family – the family that can’t wait to have them home. Speaking of their siblings…according to Chad, 12-year-old Caleb and 9-year-old Kaitlyn can’t wait for them to come home either! And sisters she will have, times three! 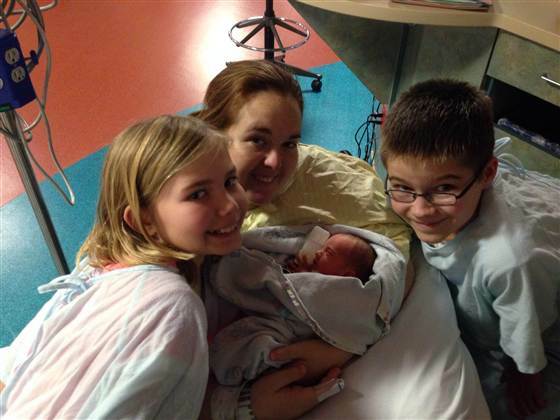 Congratulations to the Doss family on their three beautiful arrivals! We couldn’t be happier for their family and wish them all the best!